A few wee updates and a big thank you! – Zombies, Run! A few wee updates and a big thank you! We had over 1600 replies to our Fitness Survey, so thanks to everyone who took part in that! We’ll be using the data to help design our upcoming games and decide what features, services and devices to develop in the future. We’ll be contacting one of you at random via email so that we can send you your Zombies, Run! prize. An 2.5.1 update to Zombies, Run! on iOS has just gone live today, too. This will solve any crashing issues you might be experiencing after you installed Zombies, Run! version 2.5 recently. Sorry about that! We’ve also just released a new 1.0.2 update to The Walk on iOS which greatly improves the app’s ability to track your walking, plus it fixes several bugs. So if you’ve noticed that the app has not been keeping up with your walks, install the update and give it a try. 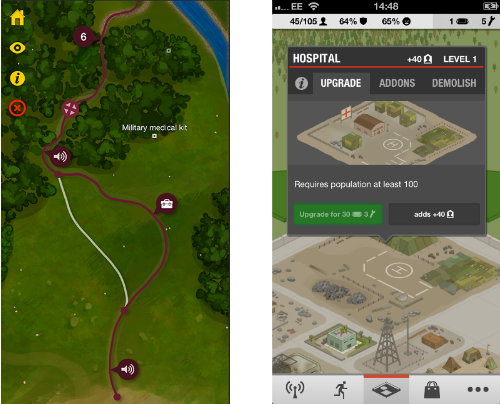 We have some updates coming for the Android version of The Walk soon, too!